Going through rehab is an important and valuable step to get the help you need for your addiction. 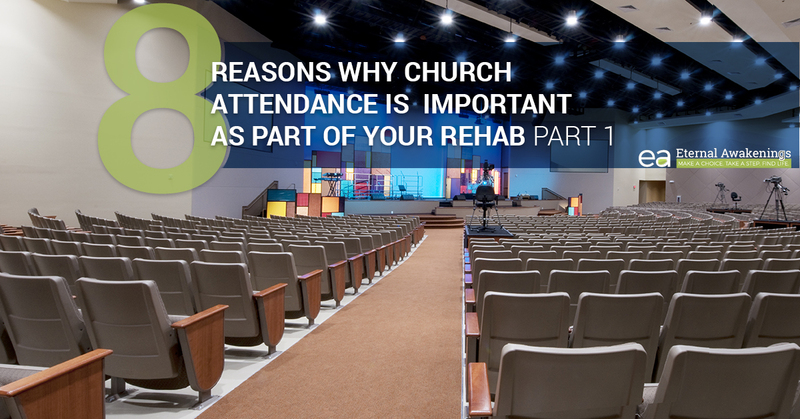 However, not everyone attends a Christian rehab program, and not every program includes church attendance. If you haven’t had much exposure to church in the past (or if you have had a bad experience with a church), it is understandable if the word “church” makes you feel slightly apprehensive. Here at Eternal Awakenings, we include church attendance as part of our Christian rehab program for drugs and alcohol. Curious to know why? Here are eight reasons why church attendance is a valuable part of your journey towards sobriety. Today, we’ll cover the first four, and in our next blog, we’ll cover the remaining four. In the Bible, the church is not a building, the church is the people who assemble together, regardless of whether there is a building or not. Jesus Christ is the head, and the people are his body. Christ’s followers are literally described as the “members of his body” here on earth. Jesus is no longer physically present, but his followers are. We are his hands and feet, and as his children, we are supposed to use our hands and feet (and eyes and ears and brains, etc.) for the same things that we’d expect Jesus to be using HIS hands and feet for, if he were here on earth. There is great value in many ways to being assembled together with the body of Christ. One of the biggest reasons that we gather regularly is because the Bible commands us to. Hebrews chapter 10 verse 25 tells us not to forsake the assembling of ourselves together, so one of the biggest reasons that Christians meet is simply to obey the Lord’s commands. There are people who will tear you down, and then there are people who will build you up. When you’re in recovery, which kind of people do you want to be mostly around you? If you’ve ever tried to quit an addiction, you know the destructive power of just one friend who is still addicted. They offer you something “just this once” and all your resolve and good intentions go out the window. What you may not have experienced before is the power of a community of believers who rally around you to hold you up, support you, love you, and root for you. That’s what you’ll find in a healthy church. What if you could suddenly be placed in the midst of a whole bunch of people who become your new friends, cheer you on towards total freedom from addiction, help you to be strong, and forgive you and pick you back up when you fall? What impact could that have on your successful journey? After you complete the Eternal Awakenings program, you might not continue to be a part of our church. After all, you might live a long way away. Many of our residents are not from Gonzales, but they come here for a brief time and then go back to their homes. Still, we believe that church attendance here is valuable. It helps you to get familiar with church. You begin to feel like an insider, not an outsider. It gives you practice in what it feels like to attend church. It helps the concept of “church” not to feel so foreign, so that when you do go back home, you can more easily integrate into a local church. We want to set you up for success, no matter where you end up choosing to attend church. Every church is different, and there’s no such thing as a perfect church. However, you should look for a church that is as healthy as possible. Otherwise, you could end up not being fed, or worse, you could be deeply wounded by the very people you trusted to be a good influence on your life. We don’t want this for anyone. Part of the benefit that you get from attending church during rehab is that you begin to see a pattern emerge, and you’ll be able to apply that pattern to future churches you try to see if they are healthy or not. Here are a few factors that will help you to determine if a church is healthy or not. It probably goes without saying that you shouldn’t attend an unhealthy church (at least, not for long). Check out our article on Things You Should NOT Expect at Faith-Based Rehab for additional thoughts on what you shouldn’t expect (either at rehab or at church). When you enroll in the rehab program at Eternal Awakenings, we’ll help you to gain freedom from your addiction to drugs or alcohol. In our Christian environment, you’ll receive teaching, medical care, and life-changing material that will set you on a course of lifelong victory. Contact us today to get started.